Background: Imaging of the kidneys and urinary tract has a significant and critical role for diagnosis of genitourinary system diseases. Although technological progress goes toward less invasive approaches, some of the current methods are still invasive and annoying. Voiding cystourethrography (VCUG) is the best and most accurate method for diagnosis and grading of vesicoureteral reflux. VCUG is a distressful procedure that gives serious anxiety and pain in a large proportion of children and fear for parents; therefore, using effective sedative drugs with the least side effects is necessary and should be considered. Materials and Methods: In this review article, importance and efficacy of different drugs before catheterization VCUG be compared in the base of literature survey on EMBASE, PubMed, and Cochrane source. Results: We found that the treatment should be based on nonpharmacological and pharmacological methods; nonpharmacological treatment includes the psychological preparation before procedures as a safety precaution with little or no risk modality, as well as reassuring support. The presence of parents during painful procedures cannot alleviate children distress. Pharmacological methods include oral midazolam (0.5 mg/kg) and intranasal use (0.2 mg/kg) that had been used 10 min before the procedure can effect on anterograde amnesia and sedation without considerable effect on accuracy and grade of reflux. Nitric oxide has a shorter recovery time versus midazolam but has a potential risk for deep sedation and may interfere with the child's voiding phase. Conclusion: In summary, oral midazolam of 0.5–0.6 mg/kg or 0.2 mg/kg intranasal is acceptable drug that can be used before VCUG. Background: The transcription factor 7-like 2 gene (TCF7L2) is an element of the Wnt signaling pathway. There is lack of evidence if TCF7L2 has a functional role in lipid metabolism and regulation of the components constitutes the metabolic syndrome (MetSyn). The aims of this study were to evaluate whether the risk allele of TCF7L2 gene polymorphism is associated with dyslipidemia and MetSyn. Materials and Methods: The MetSyn subjects were participated only based on the National Cholesterol Education Program – Third Adult Treatment Panel criteria. In this case–control study, the DNA from MetSyn patients without (n = 90) and with type 2 diabetes (T2D) (n = 94) were genotyped. 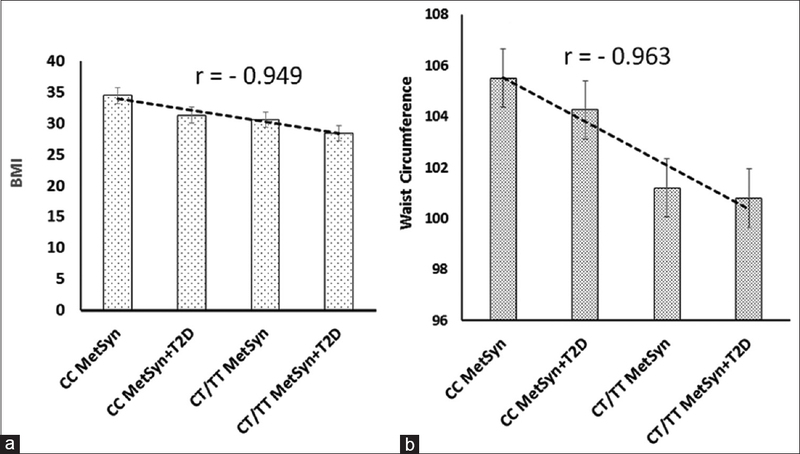 Results: The results show that the genotype-phenotype for CC, CT/TT of TCF7L2 gene polymorphism correlated with body mass index and waist circumference in MetSyn and MetSyn + T2D subjects (r = −0.949 and r = −0.963, respectively). The subjects that only possess MetSyn but are not diabetics show the 2 h postprandial glucose and fasting blood glucose, glycated hemoglobin significantly lower (P < 0.05) than those subjects have both abnormality. 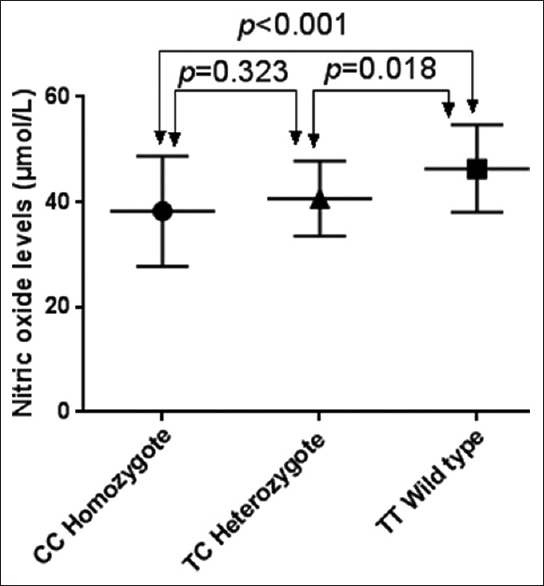 The level of triglyceride in CT/TT carriers in MetSyn was higher than CC carriers (P = 0.025). A comparison with the controls subjects, the frequencies of the T allele in the groups of MetSyn (46.66%) and MetSyn + T2D (47.34%) show significantly different (P < 0.05). The odds ratios for T allele in (MetSyn)/(normal), (MetSyn + T2D)/(normal), and in (MetSyn + T2D)/(MetSyn) were 3.59 (95% confidence interval [CI], 1.33–9.67, P = 0.0093), 3.76 (95% CI, 1.40–10.07, P = 0.0068), and 1.08 (95% CI: 0.55– 2.11, P = 0.834), respectively. Conclusion: The results revealed the important insights essential for the role of TCF7L2 that the T allele of TCF7L2 plays a significant role in the susceptibility to dyslipidemia, MetSyn, and T2D. Background: The most common clinical indication of aminoglycosides (AG) is the treatment of serious Gram-negative infections. The aim of this study was to evaluate plausible effects of atorvastatin on the biomarkers of acute kidney injury (AKI) in patients receiving amikacin. 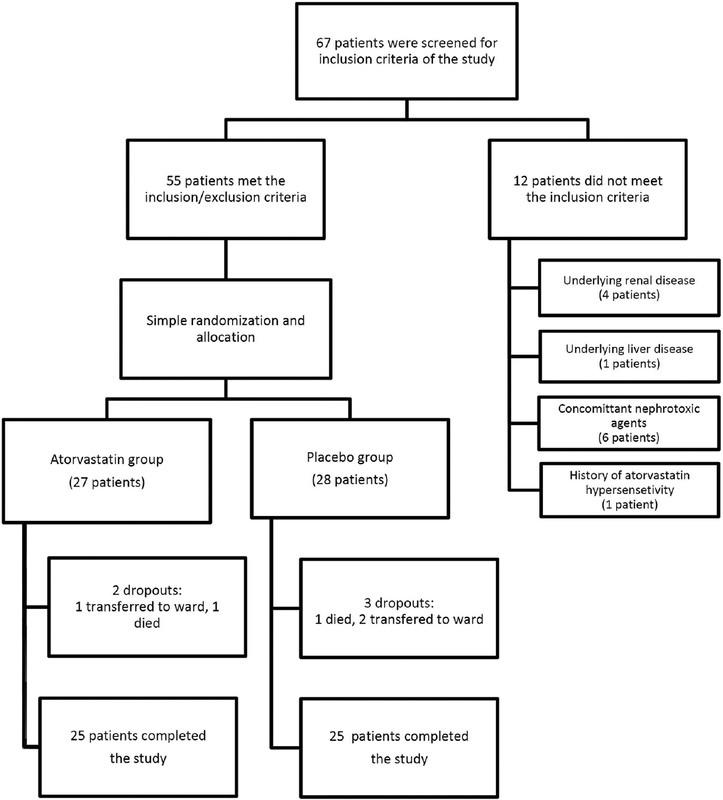 Materials and Methods: In this double-blinded randomized clinical trial, fifty patients (25 in each group) receiving amikacin (15 mg/kg/day) were randomly assigned to either atorvastatin (40 mg/day) or placebo (40 mg/day) groups for 7 days. Blood urea nitrogen (BUN), serum creatinine (SCr), and urinary neutrophil gelatinase-associated lipocalin (NGAL) levels were measured at days 0, 1, and 7 of amikacin treatment. Results: During the study period, 4 (8%) patients including two patients in each atorvastatin and placebo group experienced AKI. Urine NGAL/urine Cr did not change significantly between and within placebo and atorvastatin groups during the study period. Similarly, the mean changes in SCr, BUN, and urine NGAL/urine Cr values did not differ significantly between and within patients with and without AKI. Conclusion: Our data suggested that the changing pattern of urine NGAL/urine Cr ratio did not differ significantly between the atorvastatin and placebo groups during the early phase of amikacin treatment. Background: The normal prostate-specific antigen (PSA) level in patients with urethral catheterization is a controversy. We designed this study to investigate the effect of nontraumatic urethral catheterization without urinary retention on serum PSA. Materials and Methods: Seventy patients scheduled for urethral catheterization before elective surgeries were randomly selected and included in the study. They were categorized into two age groups: 40–60 years (Group A) and over 60 years (Group B). Total PSA, PSA density, and free/total PSA were assessed before and after catheterization. Results: The PSA levels showed no statistically significant rise after urethral catheterization. The average of PSA level was 1.01 and 1.6 in A and B Groups, respectively, and changed to 1.38 and 1.80 in A and B Groups 1 day after catheterization (P > 0.05). Free/total PSA was 28.75 and 26 in A and B Groups before catheterization and changed to 28.35 and 27.5 in A and B Groups after catheterization (P > 0.05). Conclusion: Nontraumatic urethral catheterization has very little effect on PSA level and in patients with urethral catheter routine evaluation of PSA rising should be considered. Hospital Incident Command System (HICS) has been established with the mission of prevention, response, and recovery in hazards. Regarding the key role of hospitals in medical management of events, the present study is aimed at investigating benefits, barriers, and limitations of applying HICS in hospital. Employing a review study, articles related to the aforementioned subject published from 1995 to 2016 were extracted from accredited websites and databases such as PubMed, Google Scholar, Elsevier, and SID by searching keywords such as HICS, benefits, barriers, and limitations. Then, those articles were summarized and reported. Using of HICS can cause creating preparedness in facing disasters, constructive management in strategies of controlling events, and disasters. Therefore, experiences indicate that there are some limitations in the system such as failure to assess the strength and severity of vulnerabilities of hospital, no observation of standards for disaster management in the design, constructing and equipping hospitals, and the absence of a model for evaluating the system. Accordingly, the conducted studies were investigated for probing the performance HICS. With regard to the role of health in disaster management, it requires advanced international methods in facing disasters. Using accurate models for assessing, the investigation of preparedness of hospitals in precrisis conditions based on components such as command, communications, security, safety, development of action plans, changes in staff's attitudes through effective operational training and exercises and creation of required maneuvers seems necessary. Background: Blood neutrophil to lymphocyte ratio (NLR) and mean platelet volume (MPV) both have been used as a simple marker of inflammation in many disorders. Here, we aimed to investigate the relationship between NLR, MPV, and familial Mediterranean fever (FMF). Materials and Methods: In this retrospective study, the files of FMF patients in pediatric rheumatology outpatient clinic were reviewed. There were 160 participants (68.4%) in the FMF patient group and 74 participants (31.6%) in the control group. Ninety of patients were in attack-free period, and 70 were in attack period. Results: The highest values of NLR were found in the patients at attack period. Patients in attack-free period and the participants in control group had similar levels of NLR (1.71 ± 0.83 and 1.91 ± 1.86 respectively) (P = 0.457), and they had lower ratios than the patients did at attack period (4.10 ± 3.11) (P < 0.001 for both). There was no significant difference between MPV values of attack patients (8.35 ± 4.91) and attack-free patients (8.43 ± 1.15) (P = 0.074). MPV values of attack patients and attack-free patients were significantly higher than control group (7.99 ± 0.81) (P < 0.001 for both). Conclusion: NLR ratio may indicate FMF attack period. Since there was no significant difference between attack-free patients and control groups, NLR ratio cannot be used as a subclinical inflammation marker. However, NLR could be a useful predictor of inflammation in FMF patients. On the other hand, since our attack and attack-free patients have similar MPV values and both had greater MPV values than control group, we suggest that MPV may be used to show subclinical inflammation. Background: Reduced bioavailability of nitric oxide (NO) and the T-786C polymorphism of endothelial nitric oxide synthase (eNOS) gene have been reported as risk factors for the development of coronary artery disease (CAD) with conflicting results. We investigated the association of plasma NO levels, T-786C genetic polymorphism, and gene expression levels of eNOS with CAD risk in an Iranian subpopulation. Materials and Methods: Studied population included 100 patients with angiographically verified CAD and 100 ethnically matched controls. 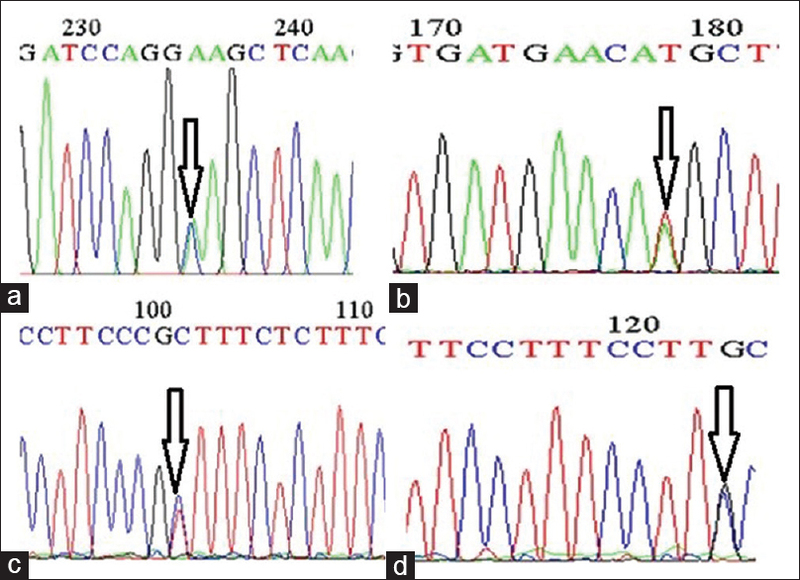 Analysis of T-786C genetic polymorphism and gene expression levels of eNOS was conducted by polymerase chain reaction (PCR) restriction fragment length polymorphism and real-time reverse transcription-PCR methods, respectively. Plasma levels of NO were measured using Griess method. Results: The CC genotype distribution (15% vs. 6%, P = 0.011) and minor C allele frequency (36.5% vs. 21.5%, P = 0.001) of eNOS T-786C polymorphism differed significantly between CAD patients and control. Furthermore, eNOS T-786C polymorphism was more common among smoker than nonsmoker CAD patients (27.7% vs. 7.8%, P = 0.044). The association of the eNOS T-786C polymorphism with the severity of CAD (number of diseased vessel) was significant (P < 0.05). The gene expression levels of eNOS were significantly lower in the heterozygote (0.49 ± 0.1, P = 0.023) and mutant homozygote (0.36 ± 0.09, P = 0.011) genotypes than that of wild-type genotype (P < 0.05). In addition, NO levels were significantly lower in CAD patients compared with control subjects (42.62 ± 12.26 vs. 55.48 ± 16.57, P = 0.002) and showed intergenotypic variation in the CAD patients. Conclusion: Our study indicated that reduced NO levels and eNOS T-786C genetic polymorphism are significant risk factors for the development and severity of CAD in the Iranian population. Complex inherited diseases affected by an interaction between collective effects of the genotype at one or multiple loci either to increase or to lower susceptibility to disease, combined with a variety of environmental exposures that may trigger, accelerate, exacerbate, or protect against the disease process. The new aspects of genetic techniques have been opened for diagnosis and analysis of inherited disorders. While appropriate Mendelian laws is applied to estimate the recurrence risk of single gene diseases, using empirical recurrence risks are the most important and available method to evaluate pedigree of complex (multifactorial), chromosomal, and unknown etiology disorders. Although, generally, empirical recurrent risks are not accurate, either because of the difference of gene frequencies and environmental factors among populations or heterogeneity of disease; using results of plenty family population studies, computerized estimating programs, genotyping technologies, and Genome-wide association studies (GWASs) of single nucleotide polymorphisms (SNPs), can make it possible nowadays to estimate these risks. The specific family situation and importance recurrence risks of some common complex genetic diseases will be presented in this review and some important multifactorial disorders' recurrence risks will be summarized to help genetic counselors for supporting families and representing better view of genetic disorders. Background: This study aimed to assess dermis fat graft (DFG) as a choice to correct the tissue deficit in the free border of the upper lip in cleft lip repair surgery. Materials and Methods: Thirty-five individuals who referred to Alzahra Hospital at 2013–2014, with lip deformity following the primary repair surgery of cleft lip underwent surgery by DFG technique. Outcomes were assessed 4 months after the surgery based on comparison of preoperative and postoperative photographs. Results: The results in 18 (51.42%) patients were excellent, 10 (28.57%) good, and 7 (20%) intermediate according to the satisfaction of patients and investigators in terms of filling of lip deficit and motion of the upper lip. Moreover, complications and pain were minimal after 4-month follow-up. Conclusion: This method introduces an admissible method with 80% good to excellent results based on satisfactory of patients and surgeon.